← Why is US Oil Consumption Lower? Better Gasoline Mileage? In Figure 1, we see that for several groupings, the increase (or decrease) in oil consumption tends to correlate with the increase (or decrease) in GDP. 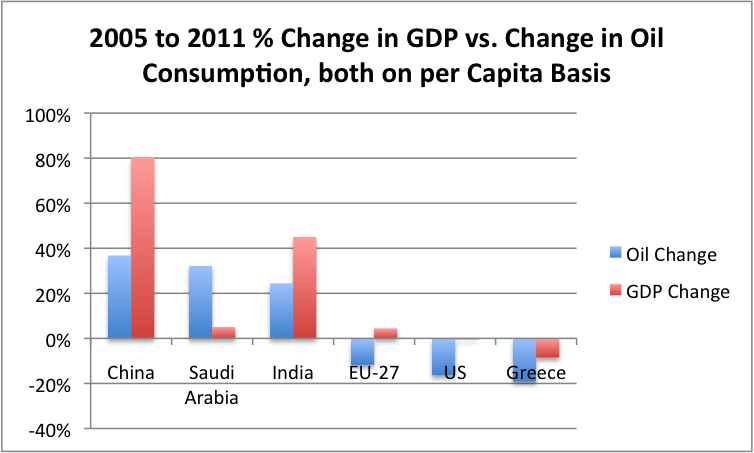 The usual pattern is that GDP growth is a little greater than oil consumption growth. This happens because of changes of various sorts: (a) Increasing substitution of other energy sources for oil, (b) Increased efficiency in using oil, and (c) A changing GDP mix away from producing goods, and toward producing services, leading to a proportionately lower need for oil and other energy products. The situation is strikingly different for Saudi Arabia, however. 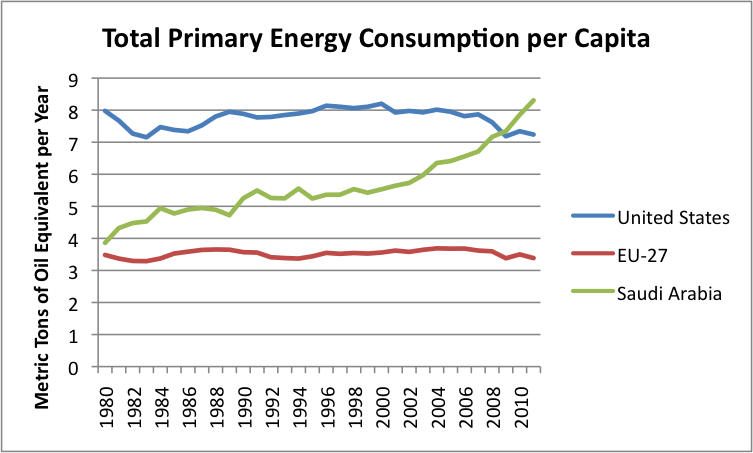 A huge increase in oil consumption (Figure 1), and in fact in total energy consumption (Figure 2, below), does not seem to result in a corresponding rise in GDP. Figure 2. Total primary energy consumed per capita, based on BP’s 2012 Statistical Review of World Energy data and population data from EIA. At least part of problem is that Saudi Arabia is reaching limits of various types. One of them is inadequate water for a rising population. Adding desalination plants adds huge costs and huge energy usage, but does not increase the standards of living of citizens. Instead, adding desalination plants simply allows the country to pump less water from its depleting aquifers. To some extent, the same situation occurs in oil and gas fields. Expensive investment is required, but it is doubtful that there is an increase in capacity that is proportional to its cost. To a significant extent, new investment simply offsets a decline in production elsewhere, so maintains the status quo. It is expensive, but adds little to what gets measured as GDP. The world outside of Saudi Arabia is now running into an investment sinkhole issue as well. This takes several forms: water limits that require deeper wells or desalination plants; oil and gas limits that require more expensive forms of extraction; and pollution limits requiring expensive adjustments to automobiles or to power plants. These higher investment costs lead to higher end product costs of goods using these resources. These higher costs eventually transfer to other products that most of us consider essential: food because it uses much oil in growing and transport; electricity because it is associated with pollution controls; and metals for basic manufacturing, because they also use oil in extraction and transport. Ultimately, these investment sinkholes seem likely to cause huge problems. In some sense, they mean the economy is becoming less efficient, rather than more efficient. From an investment point of view, they can expect to crowd out other types of investment. From a consumer’s point of view, they lead to a rising cost of essential products that can be expected to squeeze out other purchases. From the point of view of an individual investor, all that matters is whether he will get an adequate return on the investment he makes. If a city government decides to install a desalination plant, the investor’s primary concern is that someone (the government or those buying water) will pay enough money that he can make an adequate return on his investment over time. Citizens clearly need water. The only question is whether citizens can afford the desalinated water from their discretionary income. Obviously, if citizens spend more on desalinated water, the amount of discretionary income available for other goods will be reduced. The same issue arises with pollution control equipment installed by a utility, or by an auto maker. The need for pollution control equipment arises because of limits we are reaching–too many people in too small a space, and too many waste products for the environment to handle. The utility or auto makers adds what is mandated, since clearly, buyers of electricity or of an automobile will recognize the need for clean air, and will be willing to use some of their discretionary income for pollution control equipment. Mandated renewable energy requirements are another way that governments attempt to compensate for limits we are reaching. These, too, tend to impose higher costs, and indirectly reduce consumers’ discretionary income. All types of mineral extraction, but particularly oil, eventually reach the situation where it takes an increasing amount of investment (money, energy products, and often water) to extract a given amount of resource. This situation arises because companies extract the cheapest to extract resources first, and move on to the more expensive to extract resources later. As consumers, we recognize the situation through rising commodity prices. There is generally a real issue behind the rising prices–not enough resource available in readily accessible locations, so we need to dig deeper, or apply more “high tech” solutions. These high tech solutions indirectly require more investment and more energy, as well. The catch with energy products is that consumers really need the products extracted–the oil to grow the food they eat and for commuting, for example. We also know that in general, energy of some sort is required to manufacture every kind of product that is made, and is needed to enable nearly every kind of service. Oil is the most portable of the world’s energy sources, and because of this, is used in powering most types of vehicles and much portable equipment. It is also used as a raw material in many products. As a result, limits on oil supply are likely to have an adverse impact on the economy as a whole, and on economic growth. A major issue today is that oil supply is already constrained–it is not rising very quickly on a world basis, no matter how much investment is made (Figure 3). Figure 3. 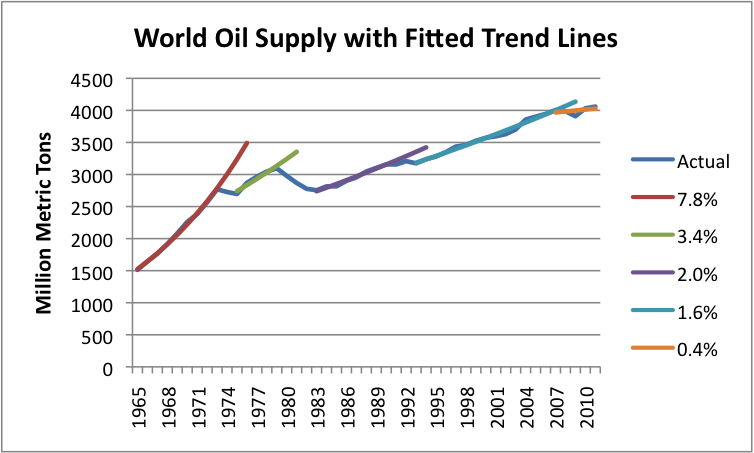 World oil supply with exponential trend lines fitted by author. Oil consumption data from BP 2012 Statistical Review of World Energy. As noted above, the easy-to-extract oil and gas was extracted first. New development is increasingly occurring in expensive-to-extract locations, such as deep water, Canadian oil sands, arctic oil, and “tight oil” that requires fracking to extract. This oil requires more energy to produce, and more inputs of other sorts, such as water for fracking. Because of rising costs, the price of oil has tripled in the last 10 years. Investment costs also continue to soar because of rising costs associated with exploration and production. Worldwide, oil and gas exploration and production spending increased by 19% in 2011 and 11% in 2012, according to Barclays Capital. Such spending produced only a modest increase in output–about 0.1% increase in crude oil production in 2011, and 2.2% increase in the first 10 months of 2012, based on EIA data. Natural gas production increased by 3.1% in 2011, according to BP. Estimates for 2012 are not yet available. If we want to “grow” oil and gas production at all, businesses will need to keep investing increasing amounts of money (and energy) into oil and gas extraction. For this to happen, prices paid by consumers for oil and gas will need to continue to rise. In the US, there is a particular problem, because the selling price of natural gas is now far below what it costs shale gas producers to produce it–a price estimated to be $8 by Steve Kopits of Douglas Westwood. The Henry Hub spot natural gas price is now only $3.38. The question now is whether oil and gas investment will keep rising fast enough to keep production rising. Barclays is forecasting only a 7% increase in worldwide oil and gas investment in 2013. According to the forecast, virtually none of the investment growth will come from North America, apparently because oil and gas prices are not currently high enough to justify the high-priced projects needed. The flat investment forecast by Barclays suggests a major disconnect between what the IEA is saying–that North America is on its way to becoming an energy exporter–and the actual actions of oil and gas companies based on current price levels. Of course, if oil and gas prices would go higher, more investment might be made–a point I made when writing about the IEA analysis. What will the ultimate impact be on the economy? I would argue that for most of the developed (OECD) countries, the ultimate impact will be a long-term contraction of the economy, similar to that illustrated in Scenario 2 of Figure 4. Figure 4. Two views of future economic growth. (1) The prices paid for resources that are subject in investment sinkholes need to continue to rise, in order to continue to attract enough investment capital. This is true both for goods that directly come from investment sinkholes (oil, gas and water) and from products that have a less direct connection, but depend on rising-cost inputs (such as food and electricity). (2) Products outside of essential goods and services will increasingly be starved of investment capital and physical resources. This happens partly because of the greater investment needs in the sinkhole areas. Also, as consumers pay increasing amounts for essential goods and service because of (1), they cut back on the purchase of discretionary items, reducing demand for non-essentials. In some real sense, because of the sinkhole investment phenomenon, we are getting less and less back for every dollar invested (and every barrel of oil invested). This phenomenon as applied to energy resources is sometimes referred to as declining Energy Return on Energy Invested. As discussed above, world oil supply in recent years is quite close to flat (Figure 3). The flat supply of oil is further reduced by the additional oil investment required by sinkhole projects, such as the ones Saudi Arabia is undertaking. Also, there is a tendency for the developing world to attract a disproportionate share of the oil supply that is available, because they can leverage its use to a greater extent. Both of these phenomena lead to a shrinking oil supply for OECD countries. The combination of shrinking OECD oil supply, together with the need for oil for many functions necessary for economic growth, leads to a tendency for the economies of OECD nations to shrink. It is hard to see an end to this shrinkage, because there really is no end to the limits we are reaching. No one has invented a substitute for water, or for unpolluted air. People talk about inventing a substitute for oil, but biofuels and intermittent electricity are very poor substitutes. Often substitutes have even higher costs, adding to the investment sinkhole problem, rather than solving it. When resource prices rise, the impact is felt almost immediately. Salaries don’t rise at the same time oil prices rise, so consumers have to cut back on some purchases of discretionary goods and services. The initial impact is layoffs in discretionary sectors of the economy. Within a few years, however, the layoff problems are transformed into central government debt problems. This happens because governments need to pay benefits to laid-off workers at the same time they are collecting less in taxes. The most recent time we experienced the full impact of rising commodity prices was in 2008-2009, but we are not yet over these problems. The US government now has a severe debt problem. As the government attempts to extricate itself from the high level of debt it has gotten itself into, citizens are again likely to see their budgets squeezed because of higher taxes, lay-offs of government workers, and reduced government benefits. As a result, consumers will have less to spend on discretionary goods and service. Layoffs will occur in discretionary sectors of the economy, eventually leading to more recession. Over time, we can expect the investment sinkhole problem to get worse. In time, the impact is likely to look like long-term contraction, as illustrated in Scenario 2 of Figure 4. Is there an End to the Contraction? It is hard to see a favorable outcome to the continued contraction. 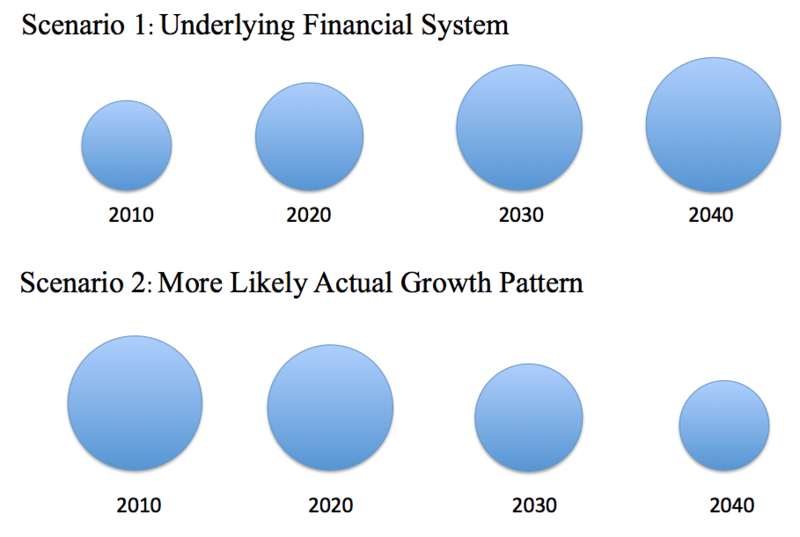 Our current financial system depends on long-term growth. The impact on it is likely to be huge stress on the financial system and a large number of debt defaults. It is even possible we will see a collapse of the financial system, or of some governments. In a way, what we are talking about is the Limits to Growth problem modeled in the 1972 book by that name. It is the fact that we are reaching limits in many ways simultaneously that is causing our problem. There are theoretical ways around individual limits, but putting them together makes the cost impossibly high for the consumer, and places huge financial stress on governments. This entry was posted in Financial Implications and tagged debt defaults, GDP growth, investment, investments, limits to growth, oil price, recession, Saudi Arabia. Bookmark the permalink. Pace Malthus. One in one hundred allowed to reproduce? Thanks. And who decides? Shall the Pentagon start printing lottery tickets? The economics of declining generations might be as decisive as the uproar of the religious is noisy. Agreed. Figuring out who is allowed to reproduce would get to be a huge problem. This is a major reason this wouldn’t work.